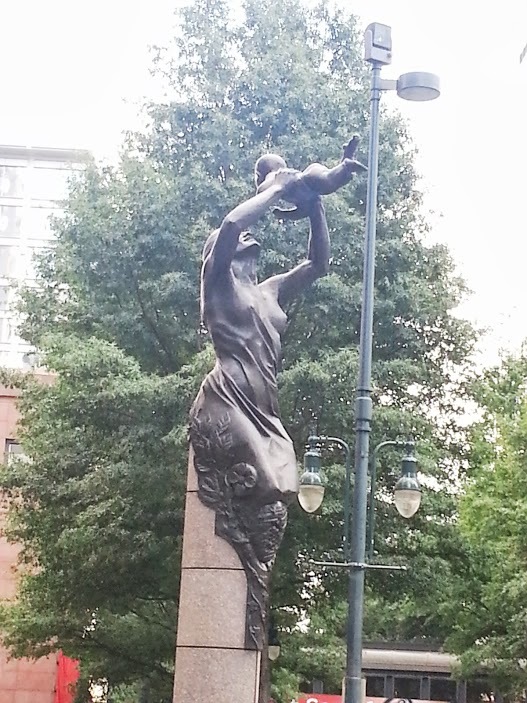 August 18, 2013 by Natasha F.
I don’t know what kind of woman Queen Charlotte was so I can’t say if she would have been proud or not of how Baby N and I were treated while visiting the U.S. city named after her. Honestly, in her time, people with earthy tones to their pigmentation where not thought of highly so she probably would have stood aghast at the sight of kindness and consideration being given to a minority woman and her mixed-race baby. Or, if she was forward-thinking and kind herself, she would have been proud. I do have two stories to tell you from that trip. I’ll tell you one now and post the other one later. Baby and I went to NC for my little brother’s wedding and stayed in a very nice hotel in uptown Charlotte. The morning of the celebration, we had breakfast in the hotel’s restaurant with my brother and another couple that were good friends of his. After a delicious meal complete with pleasant, comfortable conversations, it was time to pay. Now, I must tell you, my younger brother is about the same complexion I am and the other couple is also Black American. Our waiter was white and had similar features to my husband (but he didn’t know that). After asking if everything was okay with the meal, he then asked if he should split the check between the two couples, which my brother immediately responded, “Oh, we’re not a couple. She’s my sister.” The waiter let out a huge sigh and started laughing. He nodded to Baby N and said, “Well nooow she makes sense! I was like, ‘Man, he must be really in love if he doesn’t notice. But how can he not notice? !’ That baby looks like she could be mine,” which was even funnier to us. I liked this exchange between the waiter and our party because he didn’t express doubt that she was my daughter, just curiosity regarding her father. And he was right! Justin was not her dad and her dad really does favor him. What’s also interesting to me is that we were in the South. We were in an upscale establishment. We were obviously very familiar with each other (almost everyone at the table held N at some point during the meal). I wonder how a different waiter’s mental conversation would have gone in another setting like a hometown restaurant in the Midwest? Or an artsy cafe in Cali?